Archaeologists discovered a chaffinch skull in the mouth of a child buried about 200 years ago in Cave Tunel Wielki; another skull was found next to the child`s cheek. This is the only modern human skeleton discovered so far a cave in the Kraków-Częstochowa Upland, the discoverers believe. The discovery was made several decades ago, but it has never been published and analysed. The biggest surprise for archaeologists was that the child was buried with a bird (chaffinch) skull in the mouth. Another similar skull was found next to the child`s cheek. "This burial is a big surprise for us. This practice is not known among the ethnologists we have asked for opinions. It remains a mystery why the child was buried in a cave in this way, not in a cemetery in a nearby village" - says Dr. Kot. Dr. Małgorzata Kot is conducting an extensive project, the purpose of which is to analyse artefacts and bones discovered by archaeologists several decades ago during excavations in caves located in Sąspowska Valley - one of the valleys of the Kraków-Częstochowa Upland. Most of the finds were boxes and ended up in storage immediately after the excavations. During the analysis of materials from these forgotten boxes, there was an unexpected discovery concerning an unusual burial of a child. 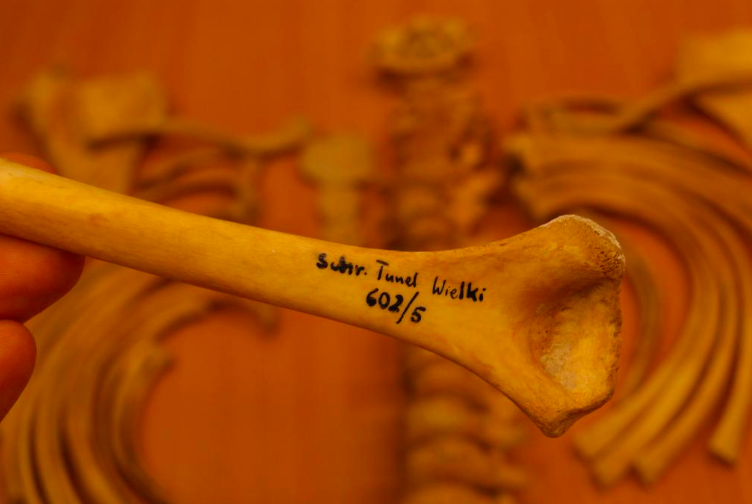 "When we opened another dusty box from an old research project, we found small child`s bones. Their discoverer, Prof. Waldemar Chmielewski, never published the details of this find, he only included a photograph of it in a book published in the 1980s" - says Dr. Kot. The recent anthropological research shows that the child was probably undernourished. Researchers plan to perform specialized analyses, including DNA and isotope tests, which will help gather more information about the deceased. At this stage, it is not even possible to tell what gender the child was. "Unfortunately, we do not have the skull of the deceased child in the University of Warsaw`s storage, it went to anthropologists in Wrocław right after the excavations were completed 50 years ago. Today, the place of its storage is unknown" - Dr. Kot regrets. The researcher hopes to find the skull, as it would be very important for further research. Interestingly, papers on the skulls of chaffinches discovered at the deceased child have been published by researchers from the Institute of Systematics and Evolution of Animals of the Polish Academy of Sciences in Kraków. But they were completely unaware that the skulls had been found by a burial. "We returned to those skulls, but new analysis did not show anything that could at least explain why the chaffinch heads accompanied the child. For example, there are no traces of cuts on the skulls. We only know that these were the remains of adult birds" - says Dr. Kot. The team of Dr. Michał Wojenka from the Jagiellonian University recently conducted excavations in the same chamber of Cave Tunel Wielki. Wojenka discovered numerous human remains, but those dated over 4,500 years. "This cave chamber was a place to which people returned to bury their dead in various periods of history" - says Dr. Kot. Sąspowska Valley, which is only 5 km long, has dozens of caves. In many of them, archaeologists have discovered traces of human activity from the Paleolithic to the Middle Ages. The oldest traces include tools used by Neanderthals. In the prehistory, people were also buried in these caves. But this custom ended with the end of Antiquity. Dr Kot regrets that the caves in the Kraków-Częstochowa Upland were very strongly damaged, especially in the 19th and the beginning of the 20th century. Then, on a massive scale, muds (sediments from the bottom of the caves) were extracted and used as a fertilizer. In the interwar period, scientists alarmed the authorities that priceless artefacts were being removed and destroyed along with the soil. Therefore, the industrial exploitation of caves was ultimately banned. "Unfortunately, we know how many valuable artefacts and bones that could tell us about the past of man were lost" - concludes Dr. Kot.